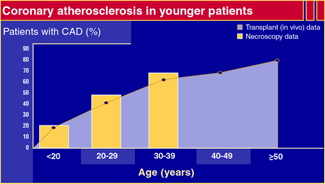 This graph shows that among individuals younger than 20, about 20% already gave significant coronary atherosclerosis; in the age group 20-29 at's almost 50%; in the age group 30-39 it's up to 65%. (Berenson et al. NEJM,1996; Tuzcu et al., Circulation, 2001).